I woke up this morning to an unexpected email from Loft. 40% EVERYTHING. Sale ends November 13, 2011. Use FRIENDS code at checkout. Oh wow! But I already bought many items that I wanted. I feel this week many companies have been bombarding me with spectacular sales. But this urgency (and the saturation of the ads) is a TURN OFF! I will still look to see if there’s any thing that catches my eye but doesn’t mean I’ll buy. Are all these ads being pushy is because of Black Friday? According to my Mom…everyday is black Friday! Retailers are hurting and I was shocked to see this deal as well! 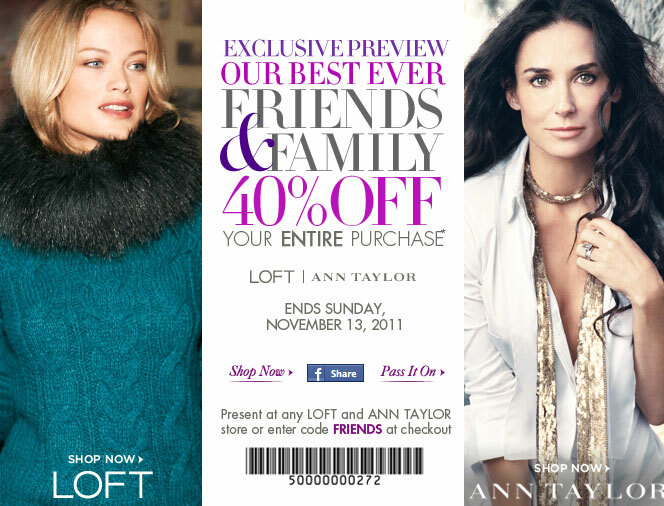 Loft had the deal 40% off storewide not long ago and now it is going on again!